Make sure you're listed and spelled correctly. If you see any other errors, please email me ASAP at bkeller@fairbankspanthers.org. You may have already heard, but Fairbanks Middle School will not have classes on Monday, December 18 and Tuesday, December 19 due to the fact that there is no heat in the building. FES and FHS will have classes as regularly scheduled. The December 18 Holiday Concert will progress as planned. JHCB and 6th Grade Band will obviously not have dress rehearsals. 6th grade band members (and FHSCB helpers) are to be in their seats in the gym at 6:55pm to warm up. FHSCB and JHCB members are to be in their seats with families at 7pm and ready to watch the 6th grade band. MS band members - I know that we will not get a chance to rehearse in the gym, but we will be fine if you rely on your training and trust the rehearsal process. Let's make music to the best of our abilities, despite missing these last two rehearsals. I have no doubt you will be successful. Any and all Fairbanks Band alumni are welcome to join us at the pep band game on Friday, December 22. Rehearsal is at 6pm in the band room. You'll be admitted free to the game...just sign in on the sheet. Several student band members will be there as well so don't worry if you're a little rusty. We've got you covered. Please text/email/FB me and let me know if you need an instrument. Music will be available at the game. Spread the word to your band alum friends. I hope to see you all there! 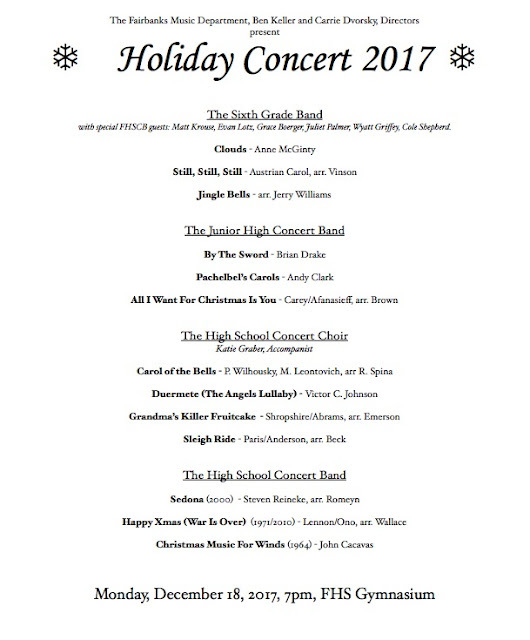 Fairbanks Music Department’s Annual Holiday Concert 2017 Monday, December 18, 2016, 7:00 P.M.